Just regular folks. : Lawn, sneaking, ice cream. I did the first lawn mow of the season today. 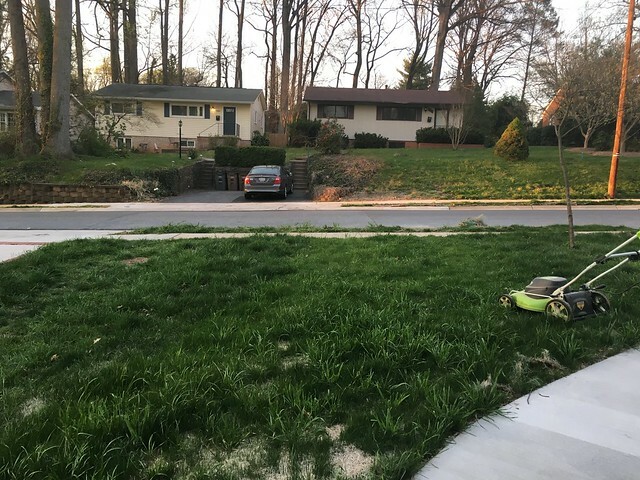 There is a City of Rockville person who drives around and gives citations to folks with overgrown lawns. I'm often on the receiving end of these citations. I'm hoping not to get one this season. While the boys are in Florida, it's me and Edda here at the homestead. Though it's MCPS spring break, it's not nursing school spring break, so I'm still working/studying through the week. I have a help though, even though it's hard for me to remember everyone's schedule. Edda's after school camp runs most days of spring break (except for Good Friday) for four hours in the afternoon from noon-4pm. Kitachi is helping me out in the mornings and evenings Mon-Wed and then she's off for her own spring break. Adriana will be around on Good Friday mid-day and for a few hours on Sat. I worked most of this past Sunday so I can work shorter hours during the week. On Sunday, the first day the boys were away (and I always get this feeling the first 24 hours after they are gone), I find myself returning to the feeling of living on one's own. I know Edda's around, but in some ways, she's like a well behaved roommate. She's neat, quiet & kind of keeps to herself (most of the time, though some days she'll hunt you down and hit you on the head while you are trying to play Candy Crush). She doesn't move things around or take something that's yours and eats it. She never argues with me. Anyways, this old feeling that I remember, but didn't know I had when I had it. This feeling of independence and total control over my environment. Of making decisions without consulting anyone or telling anyone. Even going for ice cream with everyone around, I can't just sneak out of the house without telling anyone where I'm going. I mean, I could sneak out, but then I'm sneaking out which happens only when someone cares that you are leaving the house or cares about ice cream. Anyways, I'm telling you, on Sunday Edda & I snuck out of the house for some ice cream. I suspect we'll do it later on this week as well.